Well, it's finally here. The day of flowers, candy and romance and my dh is hundreds of miles away. Oh well, what can you do?? I'm still having a good day regardless! It was made better when I got a sweet card from Tanya in the mail! 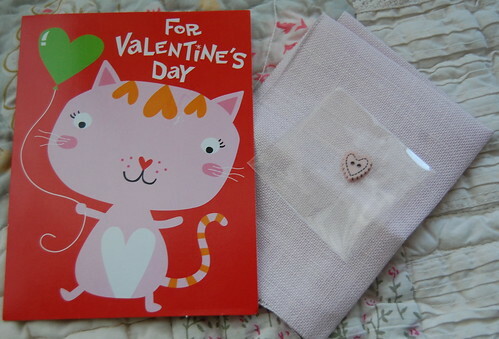 She included a cut of pretty pink linen and a cute little heart button! I love it Tanya, thank you so much!! 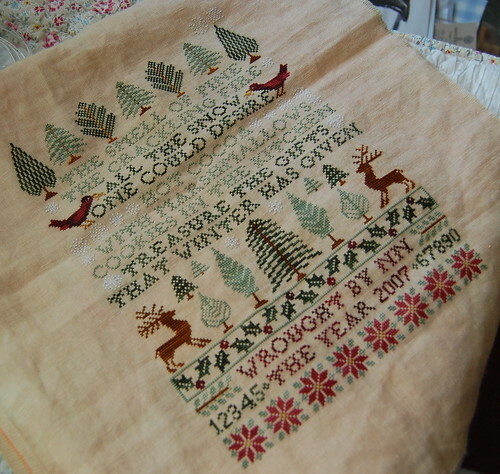 I did get a little stitching done last night. I finally finished up the tree row on Poinsettias and Pines. I'm so glad to have that row done!! I love that little button - it's totally adorable! Have a happy Valentine's Day, Nicole! Glad you liked your Valentine surprise, Nicole. The P&P is looking awesome!!! Nicole - I love your Pines and Poinsetta's! It's turning out really well. Hope you had a wonderful Valentine's Day! P&P looks really beautiful, Nicole! I tagged you on my blog...check it out! Nicole - P&P looks great. You must be close to finished!